Robert Johnson was born 07 Jan 1778. His parentage is uncertain. Robert served in the War of 1812 as is indicated by the Pension Form shown below. The War of 1812 was a 32-month military conflict between the United States and the British Empire (and their Indian allies) which resulted in no territorial changes between the British and the US, but a resolution of many issues which remained from the 1776 American War of Independence. The United States declared war in 1812 for several reasons, including trade restrictions brought about by Britain's continuing war with France, the impressments (forcing) of American merchant sailors into the Royal Navy, British support of American Indian tribes against American expansion, as well as outrage over insults to national honor after humiliations on the high seas. Robert eventually married Mary Wilkinson prior to 1814. Little is known about the early life of Robert and Mary. 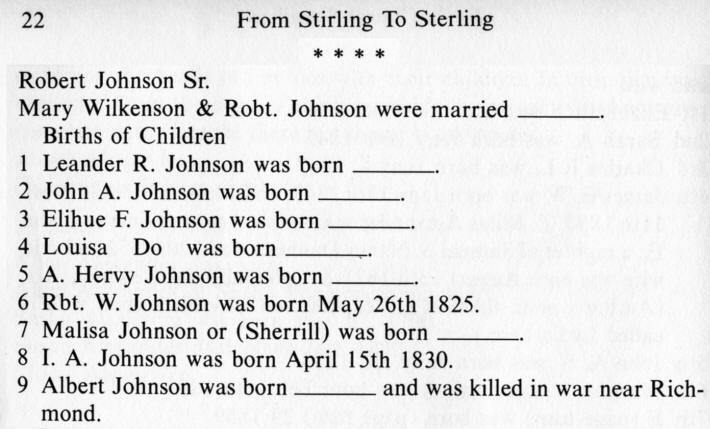 The book "From Stirling to Sterling - The Bicentennial History of New Sterling Associate Reformed Presbyterian Church" by Mildred Miller gives additional information about the life of Robert and Mary Johnson from church records. For some reason, Pinkney C. Johnson was not listed in the book "From Stirling to Sterling". Mary " 45 F "
Israel A. " 20 M G. Teacher "
By 1850, there were only three of the children still living at home. They were Israel, Albert and Mary. Israel was a Grade School Teacher. 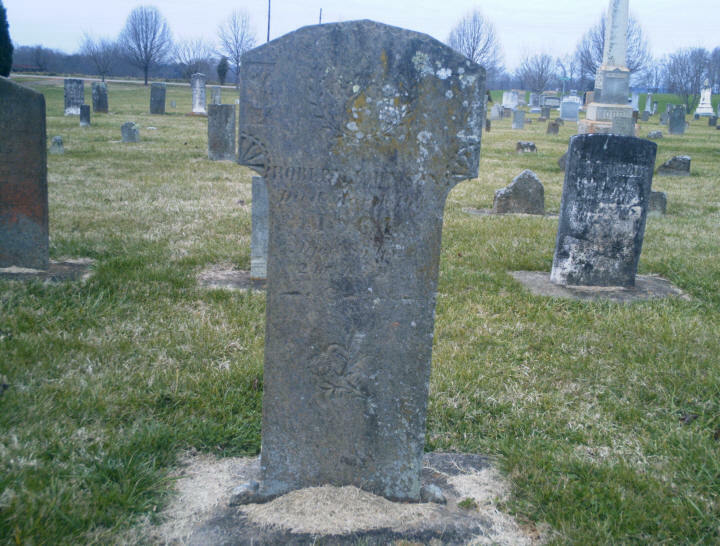 Robert's wife's, Mary's, age is listed as 45, which places her time of birth around 1805. Son, Leander, was living nearby. The 1850 list his age as 36 which puts his time of birth around 1814. If both dates are correct, Mary could not have been Leander's mother, but instead his step mother. The 1860 census lists her age as 66 and thus her date of birth around 1794. If this date is correct, she could indeed be the mother of Leander Johnson. In 1850, Leander Johnson was married to Mary (Unknown) whose age is listed as 29. 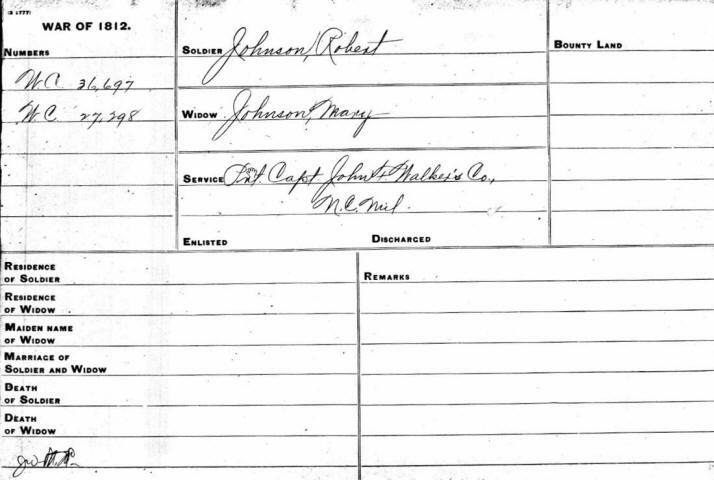 Their children listed on the Census were Martha J. age 7, Sarah A. age 5, Henry N. age 2, and Margaret age 2/12. Mary " 66 G (F) Wife "
Albert N. " 22 M Blacksmith "
It seems that Robert was 16 - 28 years older than Mary. Israel was no longer living on the family farm. Albert is no longer working exclusively on the family farm, but is listed as a blacksmith. Daughter Mary, who would be 25 years old, is no longer living at home, but a Miranda McKay was living with the family. Robert may have had several other children, too. Records indicate that his son Pinkney C. Johnson was our direct descendent. Robert died 16 Mar 1864. He is buried at New Sterling ARP Cemetery in Iredell County, NC. His tombstone says he was 86y2m9d at the time of his death. The unknown stone carver of this headstone used a peculiar combination of folk art and an abstract form of the Scottish Thistle, which is the national emblem of Scotland. If you have photos or additional information about Robert Johnson, please contact me.